All ringers know that certain birds can become frequent visitors to traps and are prepared to enter them and eat the bait regularly. The inconvenience of waiting for release being outweighed by the readily available supply of food. The site at Icklesham runs a duck trap during the winter months and catches a trickle of Mallard, Tufted Duck and Coot. 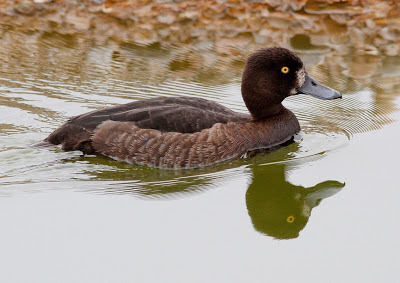 We knew that female Tufted Duck with ring FA80827 is a regular visitor but we were surprised when she was retrapped for the hundredth time on 28 October 2012! She appears to be a migrant as she never turns up in the trap early in the autumn, in 2009 her first catch was 03 December and this year we caught her for the first time on 27 October. She was first ringed 27 September 2008 so hopefully will be a regular for many years to come. Thanks to Phil Jones for letting us know and to Barry Yates for the great photo. This entry was posted in Birds, Environment and tagged ducks, UK by petrel41. Bookmark the permalink. Hi Missus Tribble, good news indeed! Oh wow, what a beauty! I think it must be the eyes, as the beaks are nothing at all alike. Thanks to you, I also now know the ID of the duck who came running up for cuddles and sat on my foot like a friendly cat when I visited Prinknash Abbey Deer and Bird Park once – it was a male Goosander and I wanted to smuggle that little cutie out of the park under my coat. He probably would have let me do it too! Goosanders are beautiful, and interesting; one of few duck species eating fish. Years ago, during a harsh winter, a female goosander stayed for days in one of few open water spots near my home. We have man-made lakes nearby (they used to be gravel pits at ne time) and I’m sure I spotted a sheltering Black Throated Diver! He shouldn’t have been this far south-east so I contacted the RSPCA, who told me that he must have been blown off course by the recent gales and he was just resting up and getting his bearings. Hi, that is a fantastic bird! Years ago, I had the luck of seeing one in summer plumage in Finland. They’re very uncommon in Britain, so I was surprised to see one – especially when not on a nature reserve! Many years ago I visited Cley Marsh – an RSPB reserve in North Norfolk. Whilst admiring the beautiful Avocets my then-partner noticed a speck in the sky; I got the binoculors in focus just in time to see a female Marsh Harrier swooping in for the kill. Unexpected and a real treat! is more on black-thoated divers. If you push #2 on the right of the page, you see the summer plumage. They nest in the Scottish Highlands.